How Much Does it Cost to Build a Shed? The price for building a shed depends on a lot of different factors. Although a shed’s primary function is to store items you typically don’t want in your house, it’s also an extension of your house. When you’re thinking about building a shed for storage solutions, the price most certainly plays a role in your decision process. For the average homeowner who values the appearance of their house and takes a lot of pride with upkeep? The shed they build must match the character of the house or the landscape it’s built on. This informative guide is the best resource for what it’s realistically going to cost to build a shed without being blindsided down the road. 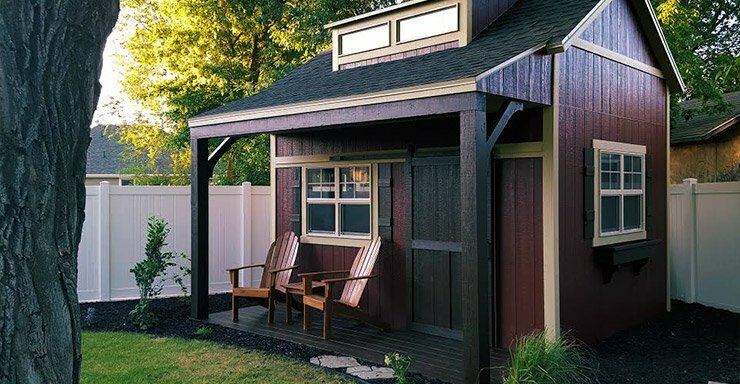 We’re going to discuss some of the things that goes into building a shed that you may not have considered, approximate prices for small, medium, and larger sheds, the price for doing it yourself, and the price for hiring a carpenter to build it by the hour or square foot. One of the first things to consider before construction is the foundation. What type of foundation you build your shed on can have an impact on the overall price. Are you going to supply your shed with electrical power either by underground service, on demand with a portable generator or none at all? Will windows be installed, and are you custom doors or installing a prefab entry door/doors? The type of siding and style of roof can also affect the overall price. You’re the only one who knows your budget and what you would like to have included with your shed? Building a shed that solves a storage solution while increasing property value is no different than building a small addition onto your home. The price can be calculated down to the square foot construction material wise; however, what you decide to install in your shed should be considered as the price can fluctuate. Once you know exactly what you’re going to build and use for name brand materials? The average price per square foot of construction materials will give you a realistic price for what you can expect it to cost when it’s all said and done. Construction materials for popular sized sheds like 8×10, 12×12, 12×16, 12×20, and 16×20 can be calculated by multiplying the two numbers together to get the total square footage. Then multiplying that number by the cost of the construction materials per total square foot provided below. For this example, all dimensions for each section have been calculated into one number that can be multiplied by your total square footage for an easier way to figure out how much it’s going to cost to build a shed. Below are sections of a shed that can be built on different applications with the average cost per square foot. These prices are based on current home improvement centers. They reflect the average grade and most commonly used construction materials. It also includes all lumber, sheathing, nails, screws, and misc materials for that particular section. No matter the size of the shed, the same total square footage number will be applied every time you multiply a different section to calculate the cost. Wood: Building a 2×6 pressure-treated sub-floor on concrete deck blocks is about $2.53sqft. Concrete: Building a 4 inch concrete slab on 4 inches of crushed gravel is about $8.36sqft. Walls: 2x4x8 common lumber framed walls with sheathing is about $3.12sqft. Timber: 2×6 common framed roof trusses with sheathing is about $3.36sqft. Asphalt Shingles: Standard architectural shingles with tar paper and drip edge is about $6.25sqft. Metal: Metal roofing can fluctuate depending on quality and type, but the average price is about $9.76sqft. Rubber: Rubber membrane on average is about $7.23sqft. Wood Shakes: Average cedar shingle shakes is about $6.39sqft. Vinyl Siding: Vinyl siding is about $23.36sqft. Fiber Cement: Fiber cement siding is about $30.90sqft. Aluminum: Aluminum siding is about $ 16.72sqft. Brick: Brick-face siding is about $29.08sqft. Stone: Stone-face siding is about $61.81sqft. Stucco: Stucco siding is about $27.27sqft. For this example, we’re going to use the 8×10 (80sqft) shed that is built on a pressure-treated sub-floor with vinyl siding and asphalt shingles. The total amount of materials required to build the above 8×10 shed is $3087.68 plus tax. Now you can factor in the cost of additional features like the entry door, windows or other items you wish to install. This will give you a very accurate estimate of what your shed is going to cost to build. For larger sheds, simply use your overall square footage number, and multiply it to the cost per square foot of each section that applies above. DYI labor is the cheapest option for building your shed. The average cost per square foot for a professional carpenter is between $2.00 and $5.00 per square foot (this square foot number reflects all surfaces). The average hourly rate is between $40.00 and $80.00 per hour. With construction materials being 25 percent higher than a decade ago, it only makes sense to do it yourself. How to Plans provides easy instructions on a variety of sheds that the average person can build by following simple directions that saves the average homeowner thousands of dollars in labor in the long run.